We celebrated the one year anniversary of this blog on Saturday. We had invited our friends over for a barbecue and I spent almost the whole day cooking up 9 new dishes with great support from my wife. Few of our friends prepared some mouth watering desserts as well. All in all a great evening spent with our friends with some real good food. A perfect weekend. There were a total of 13 dishes, with one of them store bought. Get a hold of this – spicy tomato salsa, yogurt dip, tofu with jalapeno peppers, paneer tandoori masala on skewers, alu tikki (crispy potato fritters), hot Italian sausages from the shop, vegetable biryani, chicken biryani, mango mousse, pumpkin cake, baklavas and ice cream. I am already feeling hungry again. I shall be posting these recipes in both my sites (www.bigsrisfood.com and www.justveganit.com) where appropriate as soon as I write about them, but will be holding the vegetable and chicken biryani back as I wasn’t at all satisfied with the final results, especially the vegetable biryani. 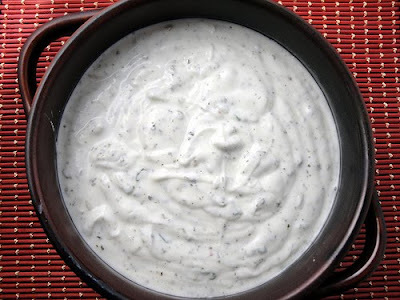 Ok now to the yogurt dip. It was, in two words, finger licking. Last Thursday I had visited a middle eastern grocery store in our area, and picked up this yogurt dip seasoning mix. It will be good in salads also or while cooking grilled meats or kabobs. I wanted to complement this seasoning mix with something else, and hence added some scallions as well. The result was just amazing. Add the yogurt to a serving bowl. Add the scallions, yogurt seasoning mix, and salt to taste. Mix everything really well. Serve cold with carrots, celery, Tostitos chips and any other vegetables you can think of. The seasoning mix I bought was made by this company called Sadaf based in Los Angeles, California. For those who cant access this product, just simply mix the following, based on your preference, to form a seasoning mix - all dried (mint, basil, tarragon, granulated onions, garlic, pepper, and rose bud flower). I know the last one is tough but the others would suffice.